Yet Rosie Jarman is all these things. She is also beguiling, fiery, intelligent—and on a quest of her own. She is looking for her biological father, a search that a certain DNA expert might be able to help her with. Don's Wife Project takes a back burner to the Father Project and an unlikely relationship blooms, forcing the scientifically minded geneticist to confront the spontaneous whirlwind that is Rosie—and the realization that love is not always what looks good on paper. This book is immediately charming, with enough plot intrigue and great character development to make the listener care about the Project and it's players. The narrator gave a great performance. Engaging entertaining and smart writing. Loved the story. Super cute story! Funny and easy to "read" with clever little twists to keep you waiting and wanting to see the various projects unfolding. Loved the reader! 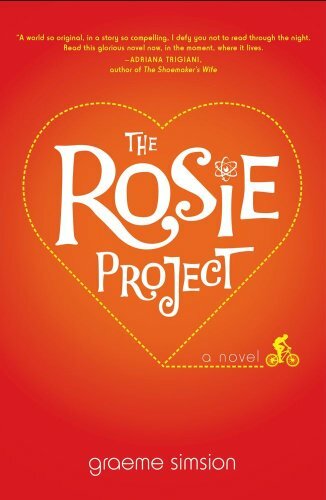 The Rosie project book was Awkwardly hilarious! Brilliantly written!! Such an enjoyable read...when I wasn't smiling from ear to ear, I was laughing out loud! The narrator was spot on, which only added to my delight with this book! This book was both heart wrenching and delightful. I enjoyed it very much! My family, two teenagers included, listened to the Rosie Project on a long road trip. It was enjoyed immensely by all! It was charming and a fun easy read. I didn't realize it took place in Australia until I listened to the audiobook. It was fun to listen to it with the Aussie accent. It did not read as a chick lit novel and very witty. I was enthralled from the first chapter. I had audible moments of laughter and "awwed" more than once and I have never done that.